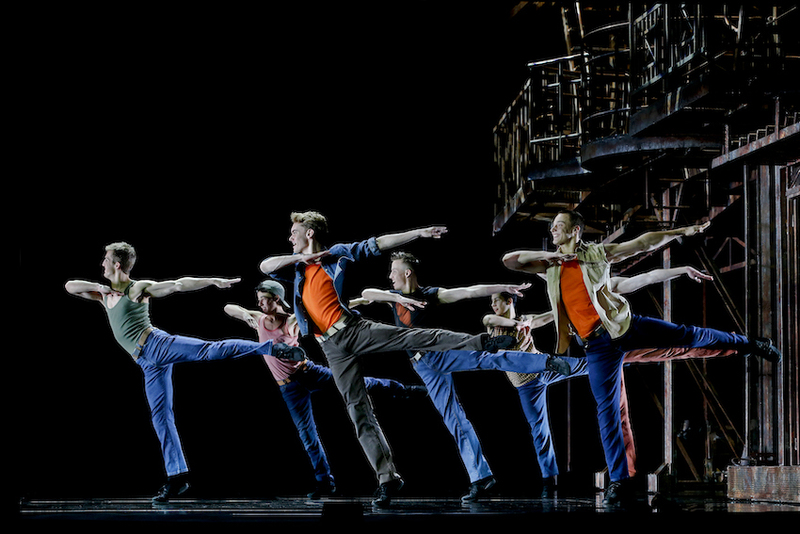 Opera Australia complements their dazzling new outdoor production of West Side Story in Sydney with the return of this traditional staging to Melbourne, differentiating the casting by showcasing a new generation of fresh young triple threats in this (indoor) Australian tour. 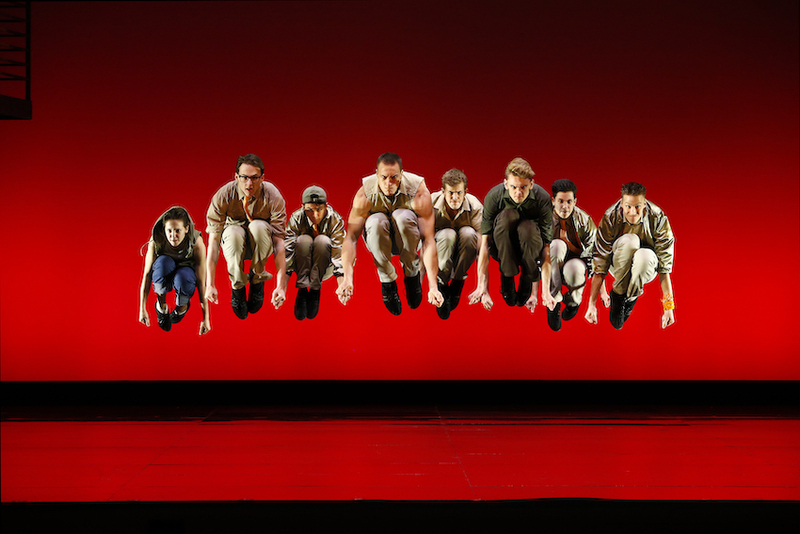 Director/choreographer Joey McKneely’s staging of West Side Story has been seen around the world and back again over the past fifteen or so years. The 2010 Australian tour of this same production introduced performers who remain in the spotlight today; from leads Josh Piterman, Julie Lea Goodwin, Rohan Browne and Alinta Chidzey to ensemble members such as Blake Bowden and Monica Swayne. Ranking high in the Top Ten of their very best work, The Production Company’s West Side Story played on this same stage less than four years ago. 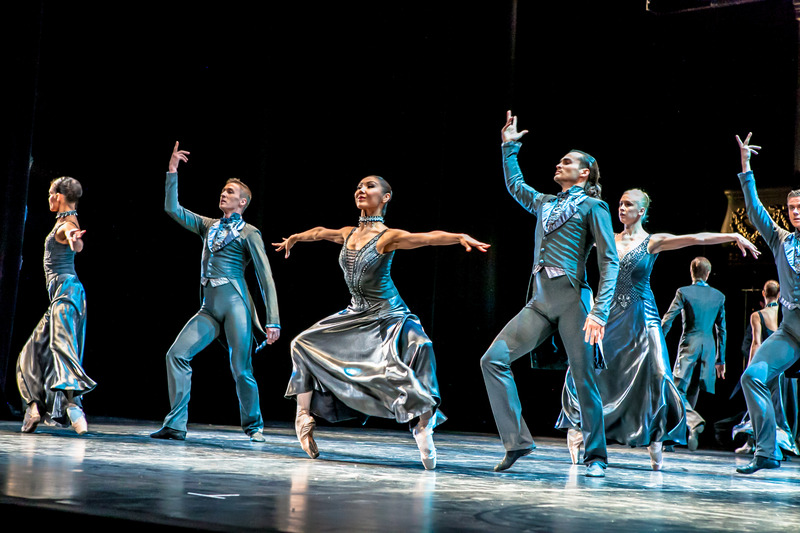 As excellent as the direction, choreography and performances were in that staging, this current time-honoured production has a clear edge in terms of sheer experience of the creative team, with Joey McKneely tracing his involvement with the show back to original director/choreographer Jerome Robbins personally teaching him the steps. While the 2010 season of this production brought 18 musicians to the pit of Melbourne’s Regent Theatre, this time there are a whopping 31 members of Orchestra Victoria playing at each performance. Conducted by veteran musical supervisor Donald Chan, the music sounds absolutely superb, especially as presented in Matthew Ground’s excellent sound design. Over and above the thrilling stage talent, the orchestral music is a clear highlight of this season. Designer Paul Gallis’ giant fire escape sets look sufficiently grand on the vast State Theatre stage. Indoor scenes such as the bridal shop and Maria’s bedroom are whipped onto the stage during carefully timed partial blackouts. Rear black and white projections conjure a sense of old world New York. A lack of indoor setting for Doc’s drug store compromises a couple of scenes, but its absence will not be noticed by most theatregoers. 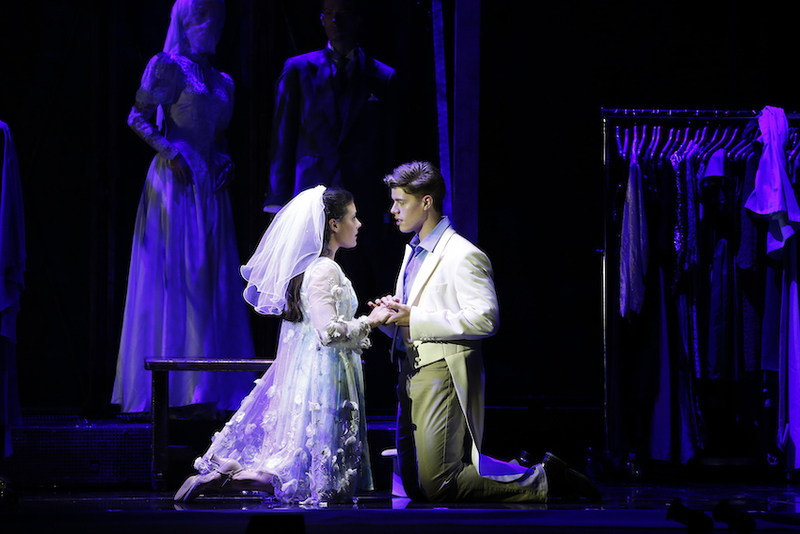 Having made audiences laugh with his goofy smile in The Book of Mormon, Todd Jacobsson has catapulted from ensemble member to bona fide leading man in West Side Story. Clearly conveying Tony’s attempt to draw himself out of gang life with his clean-cut appearance and gentle manner, Jacobsson also expertly sidesteps any mawkishness in the whirlwind romance, instead exuding an authentic sense of enthralment that infectiously spreads to the audience. Best of all, Jacobsson’s singing of the classic role is a dream, his creamy supple tone judiciously expanded with bursts of powerful head voice to terrific effect. With further experience and the full development of vocal control, Jacobsson is sure to be a musical theatre perfomer of great renown. Making a highly auspicious professional theatre debut, Sophie Salvesani exhibits a heavenly soprano voice. Her high C at the end of “Tonight Quintet” is to die for. Salvesani’s petite frame makes her Maria appear all the more vulnerable. Salvesani’s highly focused performance ensures that Maria’s journey from impatient, wide-eyed girl to dreamy lover to broken young woman (which takes place over a mere two days) is as authentic as it is impactful. Chloe Zuel’s stage experience allows her to bring an edge of maturity to Anita, establishing why the young woman is a natural leader amongst the Shark girls. In her highest profile lead role to date, Zuel displays wonderful comic timing in addition to first-rate singing and dancing skills. “America” is a sensational highlight of act one, largely due to Zuel’s performance. Zuel’s aggressive Anita contrasts effectively with Salvesani’s vulnerable Maria in “A Boy Like That; I Have A Love.” Zuel’s emotional outpouring at the end of the “Taunting Scene” ends her arc on a very affecting note. Lyndon Watts gives a neatly calibrated performance as sultry Sharks leader Bernardo, unspooling the character’s cool confidence as his tension and fear threaten to bubble over into anger. 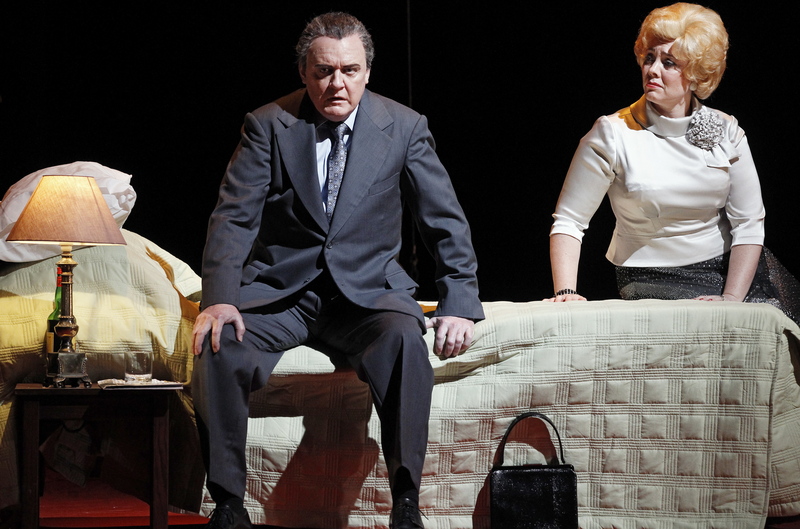 Dressed in sharp red and black, Watts’ performance makes Bernardo a compelling figure at all times, and his absence is a loss in act two. Noah Mullins also makes a notable professional theatre debut as Jets leader Riff, singing and dancing with easy confidence. As an example of the youth of the cast, the scene where A-Rab (Nicholas Collins) and Baby John (Christian Ambesi) rile up pot-bellied Officer Krupke (Dean Vince) is a very effective one, with the two boys coming across very convincingly as frightened teens. The fresh excitement of this cast should override any hesitation from musical theatre fans who have already seen this production of West Side Story (or similar). 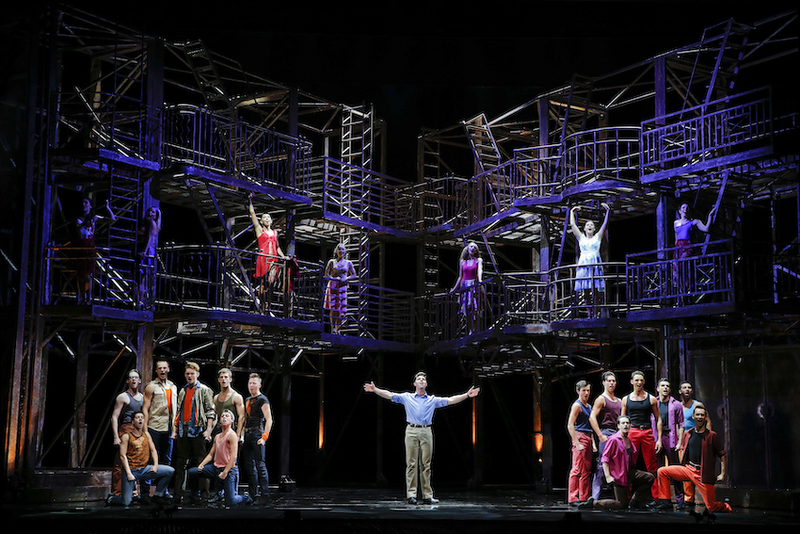 Australian musical theatre is in healthy shape indeed if West Side Story indicates the future standard of our performers. Man in Chair also reviewed Handa Opera on Sydney Harbour: West Side Story. 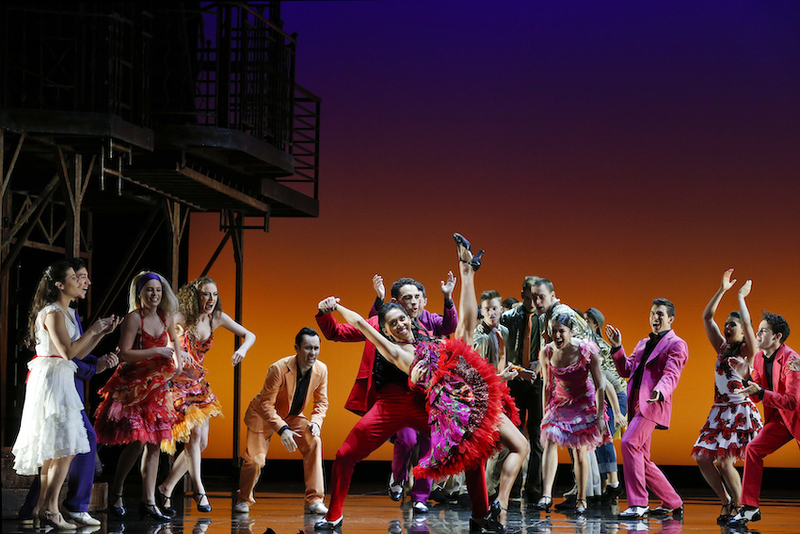 West Side Story plays at State Theatre, Arts Centre Melbourne until 28 April 2019. 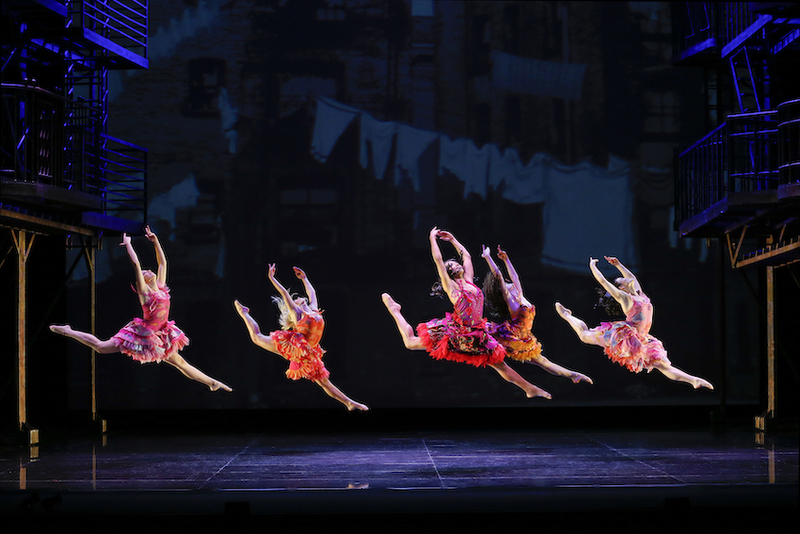 West Side Story then tours to Sydney, Canberra and Adelaide. I really enjoyed reading this review Simon and how you brought in some comparisons with the current Sydney Harbour production. It has helped prepare me for the inside production and I do hope we too in Adelaide get that enhanced sound you mentioned. In was interesting how the sound palette of Mamma Mia paled beside the superior balance of Priscilla. Yes, good design can really make all the difference to the enjoyment of a performance. Hopefully the large orchestra will be a feature when West (in)Side Story visits each city on its tour. It’s seeing really well here, so the tour would seem to be a safe bet to continue as planned. Will be interested to hear your thoughts when the show is in Adelaide.